Adjusted EBITDA and Free Cash Flow are non-GAAP financial measures. These non-GAAP financial measures should be considered in addition to, but not as a substitute for, the information provided in accordance with GAAP. Reconciliations for these non-GAAP financial measures to the most directly comparable financial measures are provided in the Reconciliation of Non-GAAP Financial Measures to GAAP Financial Measures tables. In Q1 2018, the adoption of the new cash flow accounting standard resulted in a reclassification of cash flows related to the deferred purchase price from securitization transactions from operating activities to investing activities. In addition, cash flows related to debt prepayment and extinguishment costs were reclassified from operating activities to financing activities. In Q1 2018, we redefined Free Cash Flow to reflect the above changes in classification and present cash flows on a consistent basis for investor transparency. The effects of this change are applied retrospectively and are provided in the Reconciliation of Non-GAAP Financial Measures to GAAP Financial Measures tables. For the full release and Fact Book, go to the T-Mobile Investor Relations page. This news release includes forward-looking statements within the meaning of the Private Securities Litigation Reform Act of 1995. 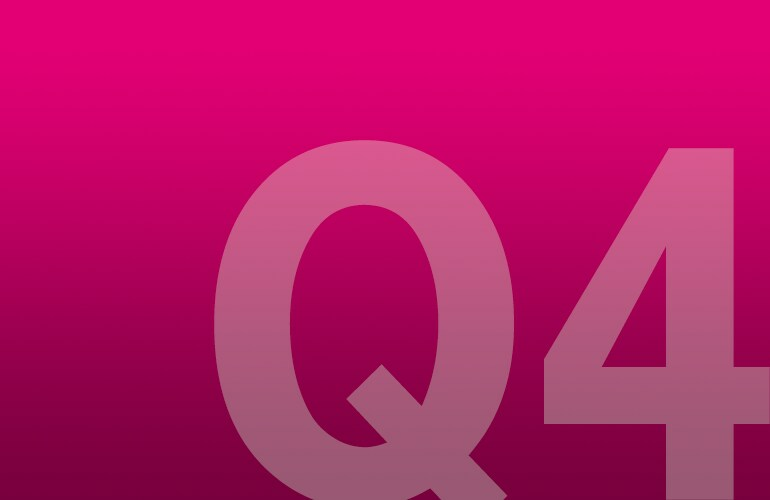 All statements other than statements of historical fact, including information concerning T-Mobile US, Inc.’s future results of operations, are forward-looking statements. These forward-looking statements are generally identified by the words “anticipate,” “expect,” “believe,” “intend,” “may,” “could,” or similar expressions. Forward-looking statements are based on current expectations and assumptions, which are subject to risks and uncertainties and may cause actual results to differ materially from the forward-looking statements. Important factors that could affect future results and cause those results to differ materially from those expressed in the forward-looking statements include, among others, the following: the failure to obtain, or delays in obtaining, required regulatory approvals for the merger contemplated under the Business Combination Agreement with Sprint Corporation (“Sprint”), and related transactions (collectively, the “Transactions”) and the risk that such approvals may result in the imposition of conditions that could adversely affect the combined company or the expected benefits of the Transactions, or the failure to satisfy any of the other conditions to the Transactions on a timely basis or at all; the occurrence of events that may give rise to a right of one or both of the parties to terminate the Business Combination Agreement with Sprint; adverse effects on the market price of our common stock or on our or Sprint’s operating results because of a failure to complete the Transactions in the anticipated timeframe or at all; inability to obtain the financing contemplated to be obtained in connection with the Transactions on the expected terms or timing or at all; the ability of us, Sprint and the combined company to make payments on debt or to repay existing or future indebtedness when due or to comply with the covenants contained therein; adverse changes in the ratings of our or Sprint’s debt securities or adverse conditions in the credit markets; negative effects of the announcement, pendency or consummation of the Transactions on the market price of our common stock and on our or Sprint’s operating results, including as a result of changes in key customer, supplier, employee or other business relationships; significant costs related to the Transactions, including financing costs, and unknown liabilities of Sprint or that may arise; failure to realize the expected benefits and synergies of the Transactions in the expected timeframes or at all; costs or difficulties related to the integration of Sprint’s network and operations into our network and operations; the risk of litigation or regulatory actions related to the Transactions; the inability of us, Sprint or the combined company to retain and hire key personnel; the risk that certain contractual restrictions contained in the Business Combination Agreement with Sprint during the pendency of the Transactions could adversely affect our or Sprint’s ability to pursue business opportunities or strategic transactions; adverse economic or political conditions in the U.S. and international markets; competition, industry consolidation, and changes in the market for wireless services, which could negatively affect our ability to attract and retain customers; the effects of any future merger, investment, or acquisition involving us, as well as the effects of mergers, investments, or acquisitions in the technology, media and telecommunications industry; challenges in implementing our business strategies or funding our operations, including payment for additional spectrum or network upgrades; the possibility that we may be unable to renew our spectrum licenses on attractive terms or acquire new spectrum licenses at reasonable costs and terms; difficulties in managing growth in wireless data services, including network quality; material changes in available technology and the effects of such changes, including product substitutions and deployment costs and performance; the timing, scope and financial impact of our deployment of advanced network and business technologies; the impact on our networks and business from major technology equipment failures; breaches of our and/or our third-party vendors’ networks, information technology and data security, resulting in unauthorized access to customer confidential information; natural disasters, terrorist attacks or similar incidents; unfavorable outcomes of existing or future litigation; any changes in the regulatory environments in which we operate, including any increase in restrictions on the ability to operate our networks and data privacy laws; any disruption or failure of our third parties’ or key suppliers’ provisioning of products or services; material adverse changes in labor matters, including labor campaigns, negotiations or additional organizing activity, and any resulting financial, operational and/or reputational impact; changes in accounting assumptions that regulatory agencies, including the Securities and Exchange Commission (“SEC”), may require, which could result in an impact on earnings; changes in tax laws, regulations and existing standards and the resolution of disputes with any taxing jurisdictions; the possibility that the reset process under our trademark license with Deutsche Telekom AG results in changes to the royalty rates for our trademarks; the possibility that we may be unable to adequately protect our intellectual property rights or be accused of infringing the intellectual property of others; our business, investor confidence in our financial results and stock price may be adversely affected if our internal controls are not effective; and interests of a majority stockholder may differ from the interests of other stockholders. You should not place undue reliance on these forward-looking statements. We do not undertake to update forward-looking statements, whether as a result of new information, future events or otherwise, except as required by law.